Degiro is a player that seems to be here to stay amongst the brokers with cheap costs. I'm not switching to it yet myself for the reasons that I explained in this article, but I keep a close eye on them to see how they evolve. 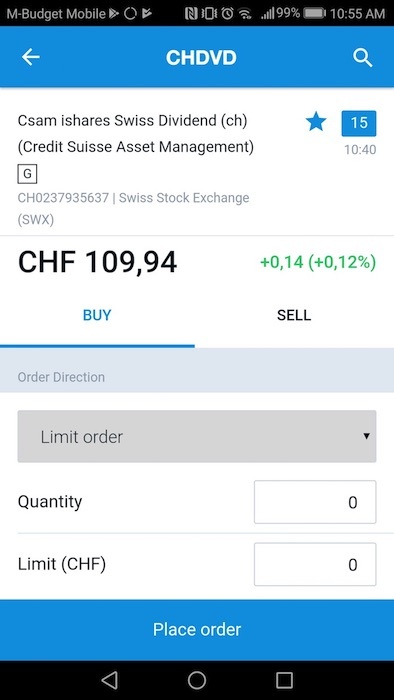 Today, it's my blogger mate The Poor Swiss who will share more infos about Degiro by sharing his experience after 4 months spent with this online broker. I’ve now been using Degiro for about four months. It’s now time for a review of the tool. I would like to mention that I never tried any other broker. I decided to use Degiro four months ago based on their cheap costs. Moreover, I’m a computer scientist, so I've no problem with potential tech issues. Finally, my portfolio is very small, so my experience may not compare to yours. Before the review, let's check what's Degiro. It is a Dutch brokerage company. The company is still relatively new. It was founded in 2008. Their online platform and opening to the public happened in 2013. Since then, they now expanded to 18 countries, all in Europe. Switzerland was opened in November 2016. Although it is quite recent, it is now the fastest growing European brokerage firm. Degiro already has 150 people. They are probably the cheapest broker in Europe. They are now managing around 35 billions CHF of transactions per year. The media are generally praising them. They have received several awards. But individual reviews were generally not as kind. Several of them mentioned the lack of security (no two-factor authentication, impossible to change password), the lack of trade confirmations, no mobile application or problems with the website or the support. But, most of the reviews were done in the early days of Degiro. And, as we’ll see in this review, most of these issues have been solved since then. The main point about Degiro is its low fees. That is their main marketing argument. One thing that is very important is that there are two types of accounts with Degiro: Basic and Custody. In a Basic account, the default one, your securities can be lent by Degiro to its prime brokers. In a Custody account, they hold your securities separately and they will never lend them. Personally, I strongly dislike the Basic account and I opened a Custody account. But, it’s unlikely that you would lose money because of the Basic account. But it’s still possible and I don’t want to take this risk. If you open a Custody account, you won’t have access to Futures and Options, but that is not a problem for ETF investors like me — and you probably! Moreover, you’ll pay a small tax on dividend (3%) that you receive. If you have a dividend-focused portfolio, this may be a bad thing. The first important thing is that there is no custody fee! You won’t pay something based on the total value of your portfolio or inactivity fees. Now, for ETF, there is something else that is really good. Each month, you can buy or sell shares of an ETF for free. You can find the list of the ETFs that are free here. If the ETF you want to buy is not in the free list or if you want to buy/sell a second ETF in the same month, you’ll have to pay a fee. For each buy (or sell), you will pay 2 EUR plus 0.02% of the amount you buy/sell. If you buy for 1000 EUR of an ETF, you’ll pay 2.2 EUR of fees. This is only 0.22% fee. If you buy for 5000 EUR, you’ll pay 3 EUR of fees. This corresponds to 0.06% fee. Because of the 2 EUR flat fee, you should avoid to invest very small amounts. Finally, the last fee is the connectivity fee. You will pay 2.5 EUR per exchange you used (hold or transactions) per year, excluding the SIX exchange. So if you have traded (or hold) in OMX and EAM one year, you’ll pay 5 EUR. You can find all other details of Degiro fees on their website. Enough about the fees. This shows that they are quite cheap. You just have to be careful because of the flat fees for buy/sell and the connectivity fees. But if you pay attention to that and use mainly free ETFs, it should be really cheap. Now, let’s go to see how to use this broker. The main entry is the website, directly accessible at degiro.ch, after you registered an account. I won’t cover the registration in details here since I already explained when I created my account. But it’s very simple to do and you should be ready in less than 10 minutes. I would strongly advise you to opt in for two-factor authentication that is now available, for more security! The main view (Market) gives you the recent information on the Market, on the principal indices (SMI, S&P500, etc. ), and about some news related to the market. You also see the main currency exchanges rates as well as the winners and losers of the day. 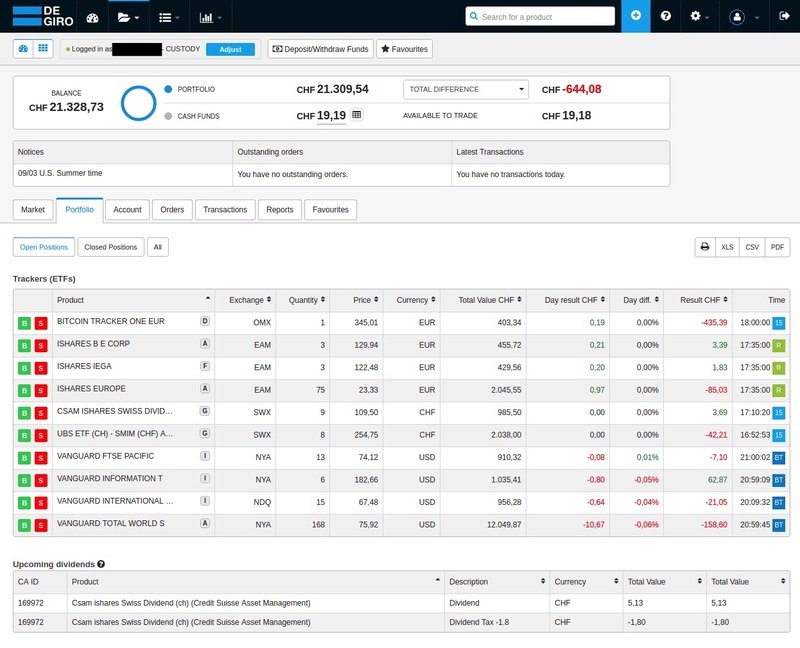 More importantly, you can see the global information about your portfolio. With the total value and the total difference. You can also see the day difference by changing the combo list. I don’t use this view much, but it gives quite some information if you want to see the current state of the market. You can also see the dividends that will be paid soon. One thing that is missing here is the total value in the base currency. I personally use the total value in the base currency to compute my net worth in each currency. 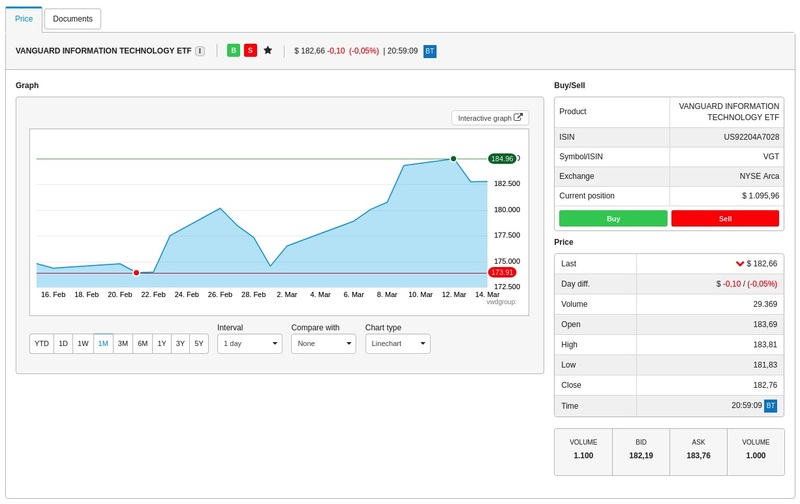 This makes it easier to follow the performance of the position without issues with currency fluctuations. 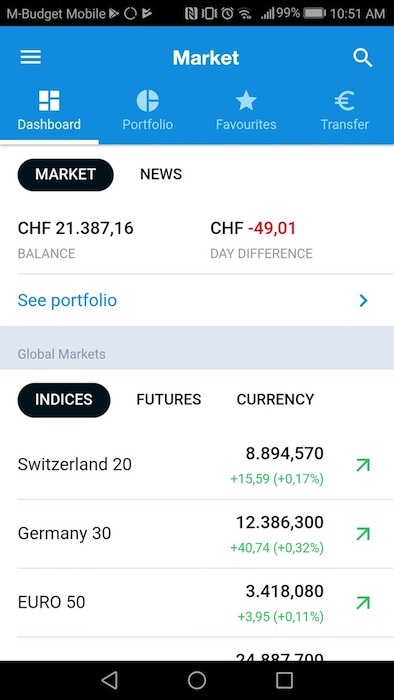 If you only care about the current total result in CHF, it should be fine. Finally, it would be better if we could select the columns we want. However, it gets the job done. You can also get details about each of your position. It will give you the history of the price of this position and some information on the prices. However, it only gives you the total value of this position, not the current number of shares. This view should give more information. For instance, the history of buy and sell would be great. Also, the day results and total results should definitely be here as well. 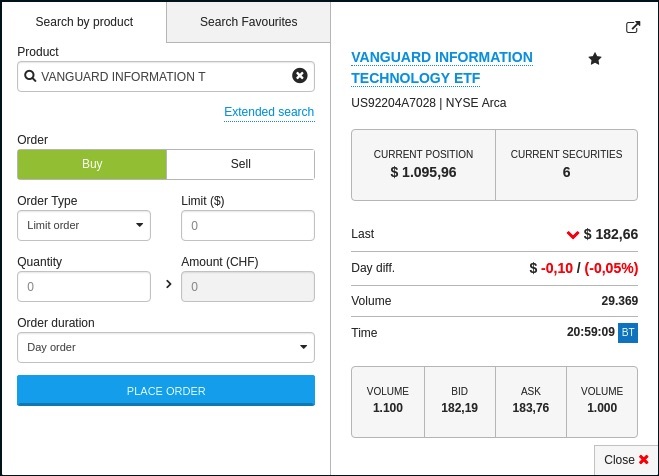 If you want to buy/sell, you only have to click on the button in the position view and you can configure your order. You can then choose between different types of order. 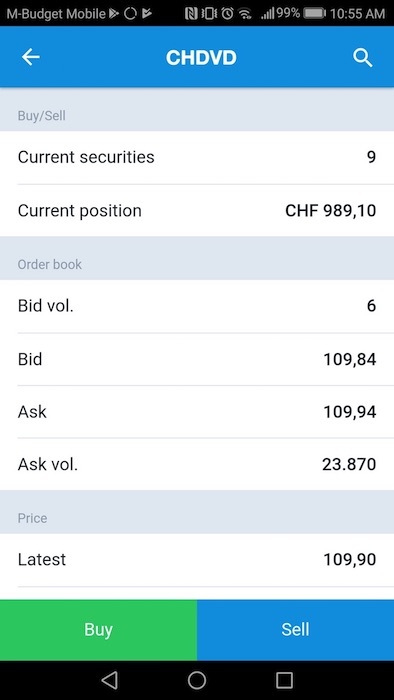 For instance, you can use a limit order to say you want to buy 10 shares at a maximum of 183 EUR. Then, the order will be executed as soon as possible based on this. It will give you an estimate of what it will cost you. This view is pretty good, it’s really easy to use. That’s it for the web application. It’s a pretty straightforward tool. It gets the job done, but it’s pretty limited in information and some things are missing from some screens. Moreover, there is no customization possibilities. It may be the computer scientist in me that talks here ;) Hopefully it will improved in the future. But it’s still quite enough for a passive investor like me. Another way to access your Degiro account is to use the mobile application. You can download the application on your phone, on Android or on Apple. I only tried the application on Android. I don’t think there are significant differences between the two versions. Since you already have an account, it’s very easy to set up the application. After you’ve setup the connection to your account, you’ll have to use a passcode to connect. Something I really dislike about this is that you have to use a 5-digits passcode… This is way too short and I don’t like the lack of security. One can argue that it’s already protected by your phone itself. Still, we should be able to use an arbitrary password here. For information, I’m using a Huawei P9 Lite for testing. The application is very straightforward to use. If you are already using the web application, you’ll see that it is quite the same. It’s just smaller and some information got moved or are not here. Let's go with the review of the main screens. 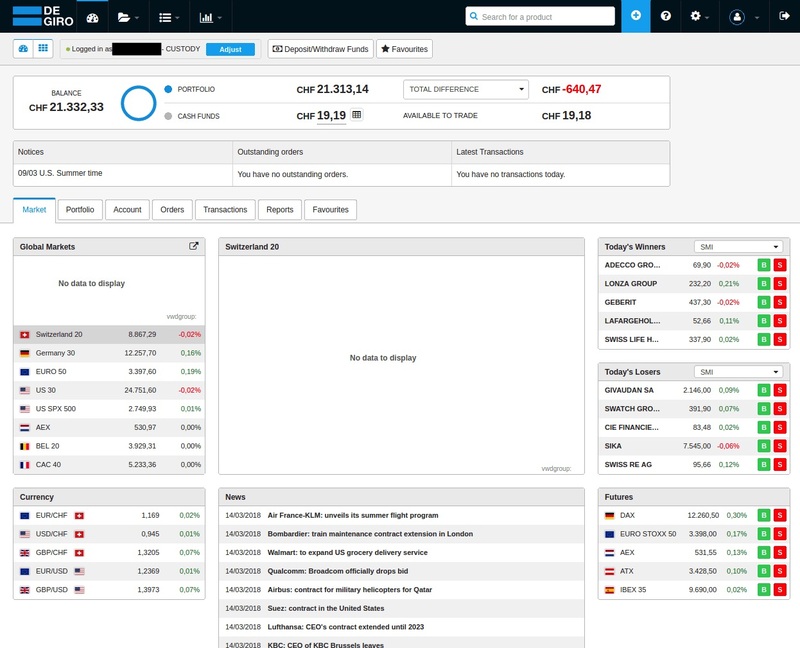 The default view is once again the Market one. You can see your balance and day result, but not the total result as you could in the web application. If you want to see the different indices and market’s winners and losers, you have to scroll down quite a bit. On the portfolio view, you can finally see your total result. And also some global information about your portfolio. You can see every position as well. But, you cannot see the total result of your positions. This is really lacking. I don’t really care about the daily result. I’m more interested in the total results of each of my position. You can also access information about each of your position. 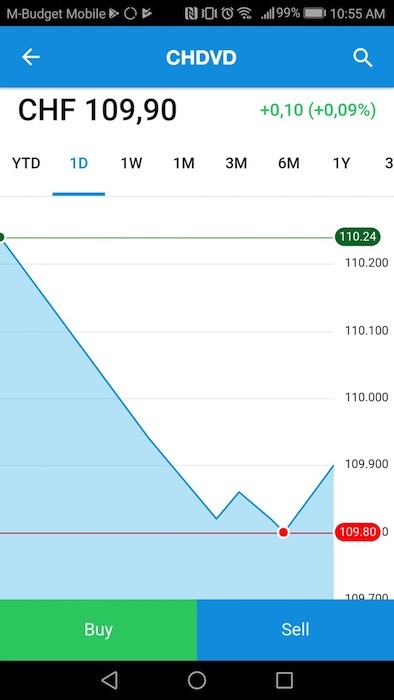 As you can see, the first thing is the graph. It’s barely readable. It should be lower on the view. You can see the shares, current price, current bid/ask information, and global price information. You may notice that you cannot see your results. There is no information here about the daily and total results of the position. This is really a problem for me since there is no way to see the total results of each position in the mobile application. To buy or sell, you use one of the huge buttons at the bottom of the position view. This opens another view. It is very easy to use, nothing much to say here. It’s not a very nice view, but it gets the job done. Overall, the mobile application is not bad, but not very good. They should add more information. They should focus on the important information first rather than put everything together. Moreover, they are wasting a lot of screen space for non important stuff. Most of the text is too big for me. Some customization of the views would be welcome. But, it’s very easy to use. Since I use the web platform more than the mobile, it’s OK for me. If the mobile application is your main platform, you may be disappointed. I’m really satisfied with Degiro as a broker so far. It’s very cheap and very easy to use. There are a few problems of course. The web interface is good but lacks some information and has a few issues. The mobile application has the same issues. It has even less information and its security is lacking. If you are an active trader and want a lot of information about your positions, it’s likely too limited for you. But for simple passive investors who invest around once a month, it’s pretty good. I also had a few contacts with the support and I think it’s pretty good. What about you? What do you think of Degiro? Which broker do you use? Note: if you choose to open an account at Degiro via one of my links, you won't notice any difference — but the MP's blog will get a referral commission. I thank you for this. I long hesitated before subscribing to their affiliate program because I am not entirely convinced by their service. I therefore reiterate my advice here: subscribe to Degiro only after doing your own research and being fully aware of the advantages and disadvantages of this online broker.